Chicago police Supt. Garry McCarthy responds to reporters' questions before an Oct. 6 City Council hearing on his department's budget. Parts of a toddler’s dismembered body discovered in Garfield Park. A teenage boy shot in the head in North Kenwood. A grandmother and her pregnant daughter shot to death in Back of the Yards, her infant grandson wounded. The stories of violence in Chicago’s black communities—heartbreaking, gruesome and surreal—have added up with frightening regularity. Last month marked the city’s most violent September in a decade. That fact—at least, in part—led members of the City Council’s Black Caucus to take aim at Chicago police Supt. Garry McCarthy at a budget committee meeting Tuesday, a day after calling for his firing at a hastily prepared City Hall news conference. 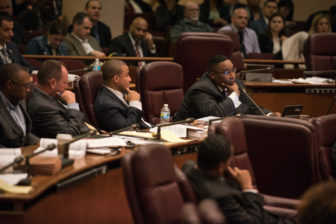 At the same meeting, white aldermen representing the city’s North Side were mostly deferential to McCarthy and largely expressed their gratitude for his leadership, exposing a broader disconnect between the experience of Chicago’s white and black residents. Ald. Brendan Reilly (42nd), who noted that McCarthy is a “voting constituent” of his ward, which covers the Loop and Near North Side, thanked the superintendent for his hard work. “Yours is one of the most difficult jobs in the City of Chicago, and we just want to make sure that you’ve got the resources that you need to complete the mission,” he said. Citywide, there have been 361 murders so far this year, McCarthy said, up 64 from the same time last year. Ten of Chicago’s 22 police districts have seen more murders through the end of September than they did in all of 2014, according to CPD. The districts are spread across the city, but the communities that have seen the most violence continue to be primarily black neighborhoods on the South and West Sides. North Lawndale has seen 22 murders so far in 2015, twice as many as all of last year, according to data collected by the Chicago Tribune. Ald. Jason Ervin (28th), a member of the Black Caucus who represents part of North Lawndale and West Garfield Park, expressed frustration that every time McCarthy comes before the council, the conversation seems to be the same. Ald. Jason Ervin (28th) questions Chicago police Supt. 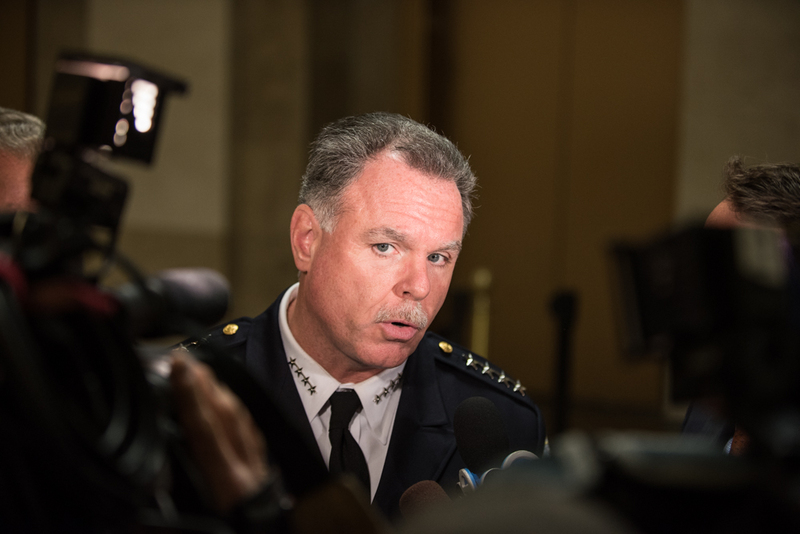 Garry McCarthy on Tuesday. Ervin tried to turn attention away from the issue of gun violence and toward the “quality of life” issues that he said he hears most about from residents. He pointed in particular to the continued heroin trade on the West Side, which led to 75 overdoses in 72 hours last week. For his part, McCarthy continued to point to lax gun laws as the main driver of violent crime, passing off accountability onto the state legislature for not increasing sentences for gun possession. He said Chicago police seize seven times as many guns as police in New York City, despite the fact that the population is one-third the size. CPD is just one part of a larger system, said McCarthy, adding that harsher sentences and stronger gun laws also help stem violent crime. Throughout the hearing, McCarthy and the members of the Black Caucus seemed to be talking past each other. “Let’s get on buses and go to Springfield,” McCarthy responded, to Austin’s visible dissatisfaction. Sometimes McCarthy met the long monologues of several black alderman with silence; other times he responded, a level of defeat in his voice. But Ald. Anthony Beale (9th) was skeptical. A new $1.3 million grant from the U.S. Department of Education will support more mental health services at 10 high schools on the South and West sides of the city, where students are at high risk of exposure to violence. What do they expect the chief of police to do? This is typical of politicians. They talk a good game but never get around to doing anything. The community has to come forward and call these criminals out. The community must work with law enforcement to rid the neighborhood of these criminals. They need to rid the community of these criminals permanently. And they need to push for more policies that put violent criminals away forever. Cause a person that murders a toddler, shoots a pregnant woman, a grandmother, a small child, or an innocent bystanders for no reason at all, has no place in our society. They don’t belong on our streets not more second of the day. The community needs to fix this. The police chief ain’t raising your children to kill one another and behave like savage animals….YOU are raising them up like that. How can a police chief undo all the violent ignorant harmful ways you’ve taught these childrens????!!!! !